Bought this on the used market. I was happy with it until I discovered two fine hairline cracks . . . on the crown! Never seen that before. Usually, a crack on the face, or where the face intersects with the crown. At first I thought it was the paint, but I sanded it down to make sure. I wouldn't buy any Gemini before the Gemini 2 model, IMO. Solid shot ever time. Added about 20 yards to my drive. Gives you more confidence in your swing. Love it and looking for fairway clubs to match. Picked up the driver off ebay for 25 bucks! This is the farthest driver i have ever hit. Has a stiff proforce 65 all gold shaft in it. Heel, toe shot still go straight with only about 10 yard max loss. Havent had any issues with cracks of any sort, maybe the prototype version was built different. Just love this driver. My swing speed has slowed over the last few years and I'm thinking of having it reshafted from stiff to regular. When I first bought it the fitter told me of the problems with the orginal Gemini and advised me to wait for the newer Gemini II and I'm completely satisfied. Love this club. UST Proforce V2 shaft in it and I absolutely love it. This club is straight and long. Hitting more fairways than ever and scoring incredibly well. Thanks KZG for a great product. Haven't noticed any of the "crack" lines that many reported with the Gemini. Will let you know if it happens. This club is absolutely crazy!!!! Got the new Gemini head with a grafalloy Blue stiff shaft and the combo is really great. Guys! I have bad news & good news. First the bad news. I had that crack in the sole of my G 460 gemini driver ( 2 years old.) I was able to return the club to KZG w/ receipt. I had the 460 9.0 Gemini crack twice. Love the performance but could not afford to keep replacing the club. KZG replaced my old Gemini w/new Gemini II. Wow what a club. This club is 300 percent better than the original. my specs are UST V2 x 76grams and 114 swing speed. I carried my old Gemini 274/yd and averaged around 286-290 yards. My new driver Carries 287/yd and my average is 304-314. 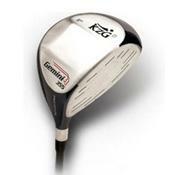 Now KZG stated they have not had any returns on the new model. They stated the driver was re-designed. I'll update you all if any problems w/new club. Received the Gemini 460 CC Driver 10.5 degrees as a gift. This is a great performing driver, here comes the but, then here comes the crack in the weld makes one wonder about the workmanship of the company. I have build clubs for twenty years I have never seen of heard of so many customers that have voiced the same COMPLAINT. The customer service at KZG is a joke and the warranty is non existent unless you bought yours from a certified dealer. I have hit and I own quite a few drivers. I sell and buy as much as any dealer. With the exception of oversized driver 480 CC'S and up, I have never seen anything quite like this. They all seem to be cracking in the same area. If you are buying a KZG Gemini Driver beware they will crack mabye not today or tomorrow, but they will crack. You authorized dealers should tell your customers about the possibility of this driver cracking along the weld. I like the driver, but KZG must stand behind their products. Many golf component companies come and go because of the lack of customer service. Since the driver is usually the most expensive club in one's bag you would think that KZG would put their best foot forward in promoting and standing behind the flagship of their company. Here is hoping that someone at KZG reads these reviews and also if you are considering buying a KZG Driver make sure your driver comes with a waranty from an authorized dealer. I dont know maybe I got a dud, but this club did nothing for me. One shot hit a high 50 yrd off center fade. Then the next one an 80 yrd off center hook. It really shook my confidence. However, when I would leave it in the bag (which I did alot) my three wood was perfect. I had it custum fitted and went back two times to complain, but the guy just gave me a few tips and said keep working. Well, not anymore I got the new f-speed cobra and my confidencs is back. I never had a problem with distance but wanted something that could find the fairway more often. The kzg was not the club for that, maybe I was fitted poorly or somthing. I read all the reviews, thats what made me go with the kzg, but it never worked for me.